A giant Ponzi scheme described by one attorney as “the worst I have ever seen,” involving perhaps up to 1,000 small real estate investors across the country and more than $250 million, is starting to come to light following a fraud complaint filed June 18 against Cabot Investment Properties by the Commonwealth of Massachusetts. According to the complaint, Carlton P. Cabot and Timothy J. Kroll, who own Cabot Investment Properties, skimmed more than $9 million into their personal accounts to support a “lavish lifestyle” in Manhattan. You can download the Massachusetts complaint here. 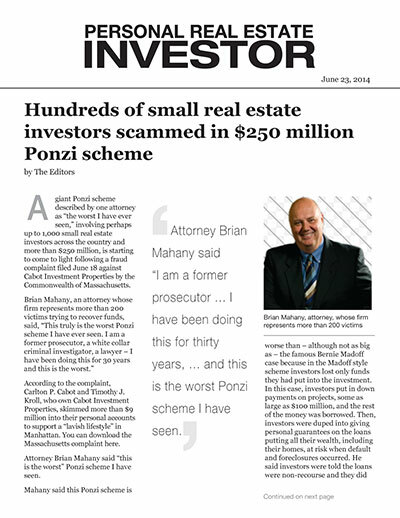 Mahany said this Ponzi scheme is worse than – although not as big as – the famous Bernie Madoff case because in the Madoff style scheme investors lost only funds they had put into the investment. In this case, investors put in down payments on projects, some as large as $100 million, and the rest of the money was borrowed. Then, investors were duped into giving personal guarantees on the loans putting all their wealth, including their homes, at risk when default and foreclosures occurred. He said investors were told the loans were non-recourse and they did not know they were signing up for personal liability on investments of $50 million to $100 million. The scheme involved hundreds of small real estate investors, perhaps as many as 1,000, many of them elderly, across the country who pooled their money with Cabot in 18 different investments called tenants-in-common exchanges which involved apartment buildings, shopping centers and other commercial investments across the country. The Massachusetts complaint is the first, but there are hundreds of investors involved across the country, said Mahany, an attorney with Mahany & Ertl in Milwaukee. Mahany describes this Ponzi scheme as the “worst” because investors were duped into unknowingly signing personal financial guarantees for the investments when they were told the investments were non-recourse, meaning they were tied only to the real estate involved. Instead the victims’ personal wealth was put at risk. He said in many cases promoters of the investments looked to brokers to sell the agreements. But many brokers knew little about tenants-in-common types of real estate investment deals, Mahany said. And many are no longer in business, he said. You can read Mahany’s blog on the Cabot case here. In addition, Mahany mentioned that a similar large Ponzi scheme was run by DBSI Group of Companies. In April, a federal jury in Boise returned guilty verdicts against four DBSI principals, Douglas L. Swenson, Mark Ellison, David D. Swenson, and Jeremy S. Swenson on multiple fraud charges, according to a release from Idaho U.S. Attorney Wendy J. Olson. “The jury’s verdicts finding Douglas Swenson, Mark Ellison, David Swenson and Jeremy Swenson guilty of fraud send a strong message that those who seek to induce investors to trust them, often with hundreds of thousands of dollars, have a clear obligation to be open and transparent and to make full disclosure about the financial condition of their business. Our financial system, indeed our markets, relies on such full disclosure. The U.S. Department of Justice is pleased that these defendants have been found responsible for the frauds they perpetrated and the losses they caused. They will have a firm restitution obligation to their defrauded victims, DBSI investors,” Olson said in the release. The indictment stated that losses in the DBSI case were $169 million. According to the indictment, DBSI purported to be an industry leader in locating, acquiring, developing, managing and providing real estate investment opportunities throughout the United States. The criminal allegations centered around material omissions, as well as false and fraudulent representations, made to investors about investment products that involved tenant-in-common 1031 exchange interests (TIC investments) and the related “Master Lease” investment product. DBSI promoted the Master Lease, whereby DBSI leased back commercial real estate that it first sold to TIC investors, as providing investors with a reliable, fixed monthly return on their investment, backed by the financial support and substantial net worth of DBSI.